Super small. Super concentrated. Double strength EPA & DHA. Half the size - easy to swallow.Bioglan Super Fish Oil Capsules provide highly concentrated Omega-3 fatty acids. Both EPA and DHA contribute to normal heart function. DHA contributes to the maintenance of normal vision and normal brain function. 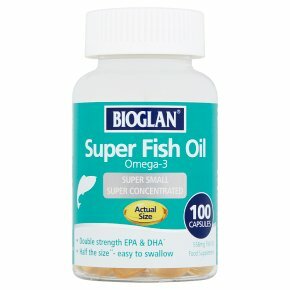 Based on daily intake of 250mg EPA + DHA Based on daily intake of 250mg DHA Bioglan Super Fish Oil isn't average fish oil! Super Small: **More EPA & DHA than a standard 1000mg (18/12) capsule - but half the size. Super easy to swallow! Super Concentrated: *Double strength EPA & DHA compared to standard 500mg capsules. Directions: Take 1-2 capsules daily after food with a glass of water. Do not exceed the recommended daily dose. Food supplements must not replace a varied and balanced diet and a healthy lifestyle. Keep out of sight and reach of children.